Shes on the road as of yesterday. Was a 2.5 year haul and has been fun and a lot of learning for me. Just wanted to close the loop. My only real complaint is the ride. Its super rough. tomasinator, Buildflycrash, Fly Navy and 2 others like this. psst....you forgot to put the hood on. nice jeep though. and yeah, she is going to be super rough. Swap out the procomp springs for bds...improved mine dramatically. rejeep and Tom_Hartz like this. James do you have a part number for the BDS springs? Also do you know off hand how many leaves/springs are in the pack (F/R)? Just asking as I might try to remove one or two leaves as a start before I go buy new springs. I suspect the ProComp kit assumes a V-8 and a full cage and a winch and a tire carrier. Who knows. Thank you brother. It was a ton of work as everyone predicted. I am pretty elated on how it all turned out. FWIW - Although the BDS site suggests tire size of 31x10.5, I run the 2.5" lift with a half inch longer warrior shackle and I fit 33x10.5s. I have a D30 and AMC20. Both came out of a 1980 CJ7. Got em cheap.... ;-) Anyway, So I had custom fit a few parts like spring perches and spring plates so it all worked. Wish I had gone BDS from the beginning but who knows. Maybe that wouldnt fix my issue. Ill take a look at the website. Thanks for sending. Did you keep the oem width springs...1.75"? If so, then any of the vintages of springs will work as the length and width stayed the same up through '75. If you already made perches and plates for the 1.75" wide springs - its should be an easy swap. The springs from any of the kits from 55-75 would work - its just the ubolts and hardware that change with some of the different packages....your D30/AMC20 would have to be sourced independently as you already know since they are kind of a custom deal on an early. I'm going to order some, Alcan Spring - Manufactures Fine Custom Leaf Springs for mine. Yes. I kept the original spring width to the 1967. So I had to custom make the perches on the AMC (they had to be moved inward on each side) and then the spring plates as well on both fronts and back. I went with the theory that if I do not go to a wider spring there will be less mass in the spring and should ride more subtle.... I guess that didn't work. I think my next real step is to move the shackle hanger location in the rear so I get a more angled shackle. Grind Grind Grind. I will move them forward 2". See what that gets me. I really don't want to be throwing money at it for new springs quite yet since the springs are virtually new. Thanks for your ideas! I installed a Rancho lift 20 years ago and had to remove springs leafs to soften/level ride.Later acquired another Rancho equipped cj5 that was rough riding and to tall.Removed spring leafs on that one to get the ride I wanted.No adverse effects on either vehicle. Bottom line is don't be afraid to play with the suspension you have before buying another brand. I also run Monroe standard shocks on both. I get what your saying...I did notice your rear shackles are a bit vertical, but that is less critical than the front ones being vertical. I was about to start removing leafs from my old springs to get a bit of flex when I came across the BDS kit cheap on CL...I think its a economical way to address the issue, and new springs will always be available if you decide to go that route in the future...don't know what is available in your area, but there is a set of 2.5 BDS springs on my local CL for the past 6mos - so keep yer eye out. I went with the theory that if I do not go to a wider spring there will be less mass in the spring and should ride more subtle.... I guess that didn't work. I think my next real step is to move the shackle hanger location in the rear so I get a more angled shackle. A wider , flatter & longer spring reduces the spring frequency and therefore softens the ride.....and yes you need to get the shackle angle correct at ride height with all the weight in the vehicle......This is where you should start.............and if your looking for lift / Arc and a nice ride in a spring.........those too factors rarely occupy the same space...................look at the drawing.. I did notice your rear shackles are a bit vertical, but that is less critical than the front ones being vertical. YEp. Thanks Tarry! I remember you and I discussing this more than a year ago. Aaaaand its been on my radar for sure. Just had to get the jeep on the road before I lost interest. Picking my battles as it were with my time/budget/interest/wifespace etc. So like i said above I think my next best step is to move the rear shackle hanger forward semi-aggressively so we get that "good angle" on the rear shackle. 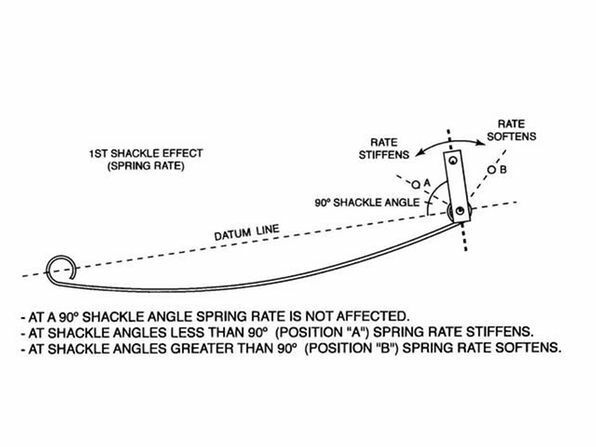 Keep in mind the shackle angle is what makes a leaf spring work.........both front & rear.......take that away and it stiffens the spring rate........on new springs we like to start that angle at about 15-20 degrees and when worn in they may approach 30-40 degrees.........and we only normally move the fixed spring location.......and stay away from stiff non-adjustable shocks........a stock shock in this application will work better. So James. I am not sure what the difference in the BDS springs vs. the springs I have is, but if they are the same length then ostensibly it will not affect my shackle angles on the front or rear. That is my understanding. It might be one less leaves so maybe softer but it wont change the shackle issue. Unless they are longer. Right? It might be one less leaves so maybe softer but it wont change the shackle issue. Unless they are longer. Right? If the springs are highly arched, when you remove a leaf, the springs will be softer and will flex or flatten out the arch under weight of the vehicle. This would make your eye-eye length longer along the datum line in Tarry's diagram above and improve you shackle angle - not sure you would get 2 inches more though - probably 1/2" maybe 1" at most - would depend on how much arch you have now and how much the spring flattens. In my case, the BDS springs were longer than what I had and provided a much better shackle angle as well as being a softer flexing spring. As Tarry's diagram shows, both the shackle angle and the stiffness of the play a role in how much flex and give there is in the suspension (both spring and shackle). Get them both right and ride quality really improves....I fought and lived with mine for 4 years as I just didn't have the money to replace...probably should have at least tried removing leaf....but swapping out was perfect for me in the end. Just to ask - what is you straight line distance between the spring hangers on the frame - are they in the oem location? Mine are in the oem location, and depending on the aftermarket supplier, some lift springs didn't really work - too short, or maybe more stock height springs that had been arched for lift which then over shortened them. A highly arched lift spring also needs to have longer leaves - and I think some manufacturers use the same length leaves for their 2" and 4" lifts and just arch them more for the 4"....but this causes them to be too short and you end up with a vertical shackle. I am not sure what the difference in the BDS springs vs. the springs I have is, but if they are the same length then ostensibly it will not affect my shackle angles on the front or rear. Your Normally working with two dimensions............1) is the eye to eye length which is just a static number that the spring at rest measures between the eyes......which is the same dimensions eye to eye +/- of your frame mounts including your shackle at a reasonable starting angle.....too short and the spring will try to invert when the suspension is in droop or hanging down..........too long and the shackle could bottom out and kill the springs performance .........just right is when at ride height the shackle is leaning back in the rear or forward in the front at an angle somewhere between say 20-45 degrees. The number 2) dimension is the actual physical length of the spring material itself following the curve of the spring eye to eye..........This length is always longer than the basic eye to eye length and much longer in a lifted spring because of the High Arch and extra length added to build the Arc.............Again high Arcs are about lift & not ride.......if your lift choice is about making more room for tire clearance first try cutting some sheet metal in the areas that are hitting..................... trying to remove leafs from a high arched spring can be done...........but the results are always clouded because as you reduce the lift and weight carrying capacity of the spring set it will always resist trying to fit and cycle in a space smaller than it was designed for........People have tried using longer shackles to accomplish that and in some cases it will help....but the results are never that great. The best solution overall to get the exact results you want the first time is have a set of springs built..............it's not that much more to do so.......and obviously much less frustrating than complaining about a rough ride............First put all your gear in the vehicle.......including how many passengers & dogs , spare tire ETC.........borrow a set of axle scales and weigh each corner........and with that info call Deaver in LA or Alcan in Colorado and they will build you a set of springs that will ride like an old Cadillac Coupe De Ville as long as the weight given is in the vehicle at all times..........more weight and it will be softer and less weight a little harsher..............Your choice!